Home » Advocacy » When am I old enough to die? When am I old enough to die? Barbara Ehrenreich’s new book has a title that makes a much-needed point: Natural Causes: An Epidemic of Wellness, the Certainty of Dying, and Killing Ourselves to Live Longer. As a metastatic cancer patient, this resonates with me. The fact is, people die. Nothing can change that–not doctors, not preventative check-ups, not healthy living. NOTHING. Our bodies have built-in components that can cause disease (cancer being one) and tissue breakdown. 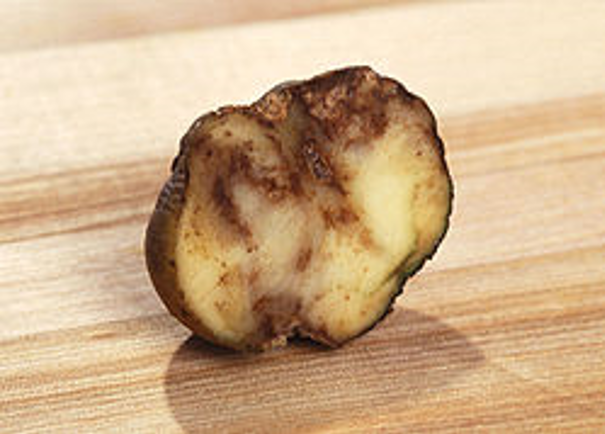 All living things will eventually wear out and reach a natural end, like the potato in image above. The Western World is so obsessed with not dying that we sometimes forget to live. Knowing how best to keep our bodies healthy is important, but at some advanced age we should stop worrying about lifestyle elements that aren’t perfectly healthful, stop intrusive testing for things that **might** kill us, and just focus on living as well as we can given our circumstances. Ms Ehrenreich excerpted parts of the book in her article in The Guardian 31-Mar-2018. In it, she addresses society’s compulsive need to blame someone for dying. Did they eat the wrong things? Drink too much? Exercise too little? Smoke? Stress over work? Essentially, it’s the same issue we wrangle with lung cancer stigma, but applied to all health conditions. Why does dying have to be someone’s fault? Reality is, we’re all going to die of something. Those sentiments reflect my own thinking nowadays. I recently had several preventative health appointments: annual physical, Hep C screening, 3D mammogram, gynecological exam, and colonoscopy. Some of the procedures seem reasonable: for instance, a new vaccine can prevent more types of pneumonia (I know from experience that pneumonia reduces my quality of life), and having a polyp snipped is an effective and painless way to prevent colon cancer. However, I wonder if I should be spending money (mine as well as the insurance company’s) to undergo screening for cancers other than the one I’ve already got, given that I’m not sure I would undergo aggressive treatment for whatever they might find. Chances are, my metastatic lung cancer will eventually recur, and sooner rather than later. If the colonoscopy had detected advanced colon cancer, and my only option to treat it was radical surgery to remove a section of my colon, I’m not sure I’d do it given my lung cancer is not cured. If I have limited life remaining, why would I spend it recovering from a significant surgery that can’t cure me? Each person will have their own answer to the question, “Am I old enough to die?” because each has their own set of priorities. I know some terminal cancer patients who would subject themselves to any level of discomfort in order to have more time with their small children. Others would find life is not worth living if they were unable to walk in the woods every day. Whether or not to undergo a cancer treatment should an individual’s decision based on personal priorities, overall health, effectiveness and quality of life impact of available treatments, and cost. But at some point, regardless of our priorities or treatment decisions, death wins. Many of us waste a lot of time, energy, and resources denying that fact. For my two cents, Barbara Ehrenreich gets it right. I hope people listen to her and consider changing their perspective on life and death. It could make a big difference in their quality of life, and perhaps in the overall burden of healthcare costs as well. I’m going to eat some chocolate now. Natural Causes: An Epidemic of Wellness, the Certainty of Dying, and Killing Ourselves to Live Longer by Barbara Ehrenreich, available 10-Apr-2018 on Amazon. This entry was posted in Advocacy, Death and Dying, Lung Cancer, The Bright Side, What Matters Most. Bookmark the permalink. Agreed…given the inevitable end of life, there’s a time (individually important) to quit spending time on worrying about perfect health and go for whatever makes life worth living. (Although in my late 20s I wrote a snarky verse that I now can’t find about what I wasn’t going to do to live longer, esp. where food was concerned….but yes, I will continue to eat what makes me happy–albeit less of it–and pursue only those medical issues that will make it easier to do the things that make life worth living…for me. I’m not interested in reaching a particular advanced age, but in doing what I enjoy (riding horses, riding a bike, walking around outdoors, writing, cooking, singing in the choir, etc.) It isn’t the duration, it’s the content. Absolutely. I’ll adjust my food consumption if it helps me feel better, sleep better, have more energy, have fewer side effects from treatment, and/or do more of what I love—or even be more socially responsible with overall consumption of the planet’s resources. To deny myself enjoyment because I MIGHT live a bit longer? Not a high priority at this point. Hi Janet, how can I connect with you? On of my friends has liver and lung cancer (incurable and inoperable as said by the oncologist). Would you be able to help with some alternate healing methods? The doctor says he has 2-4 weeks left. I’m sorry your friend is dealing with such an aggressive cancer. Exactly what type of cancer does your friend have? It’s unusual to have cancers start at the same time in two different organs—usually it originates in organ and spreads elsewhere. It is important to know the type of cancer because it determines treatment options. I strongly recommend your friend get a second opinion at a major academic cancer center. If your friend has non-small cell lung cancer that has spread to the liver, they should have the tumor tissue tested for mutations to determine if they are eligible to take targeted therapy. 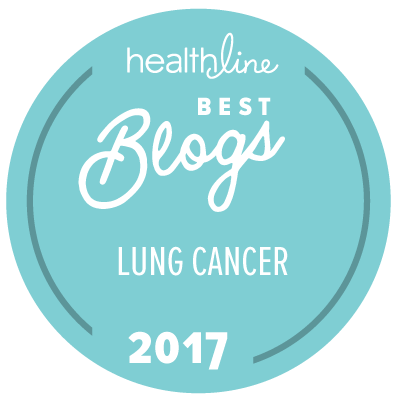 If their lung cancer doesn’t have mutations, they can probably get treated with immunotherapy. However, if they have liver cancer, treatment options are different. I am not knowledgeable about alternative treatments for cancer, or treatments for cancers other than lung cancer. If you know the specific type of cancer, I might be able to help you connect with an advocate for your friend’s type of cancer. A friend of mine’s (a Lutheran pastor) ministry focus has been determining when to “let go”, allow things to end. At one point the focus was on things like ministries, then relationships. Now she’s a hospital and hospice chaplain. It is a deeply antithetical concept to our culture in the west. As someone suffering from a progressive disease, I agree. I also belive in miracles and have had many. I will press to live as long as I can for love of family and friends but when my time here is over, I hope to leave with dignity and grace …and hopefully in my sleep. I look forward to this book.